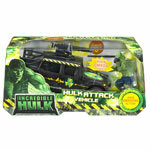 In the world of Marvel comics comes THE INCREDIBLE HULK! Don\'t get this guy angry or else he will turn into one mean green angry beast. We have action figure straight from the movie by Ang Lee, Marvel Legends Figures from Toybiz toys, AND the new Incredible Hulk figures from the Incredible Hulk movie starring Edward Norton.